QPR are pleased to confirm that 2018-19 Hoops Memberships are now on sale. 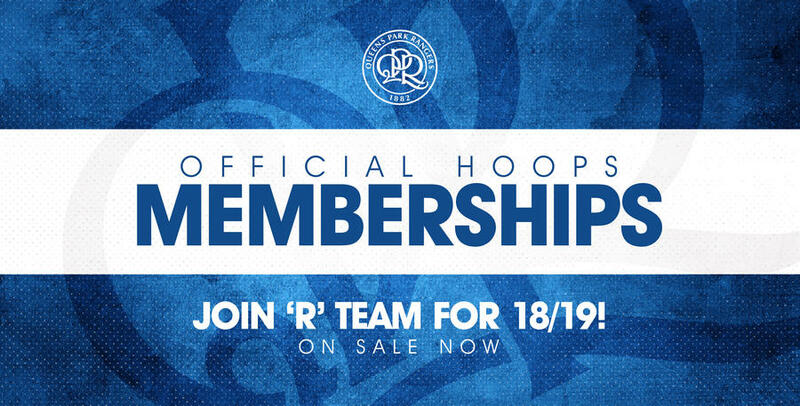 Being a Hoops Member is your way to Join ‘R’ Team. With access to exclusive ticket pre-sales and discounts, offers at the QPR Superstore and an exclusive gift pack for both adult and junior members, you’ll be all set for the new season ahead. 2018/19 Members will also receive some new benefits including 5% off all items excluding kit at the QPR Superstore, automatic entry into monthly competitions to win great prizes and the opportunity to attend exclusive QPR events such as Fans’ Forums and Junior Hoops events. In addition, the members discount on tickets will now be available to supporters up to 3 hours prior to kick off instead of just being available in the members' ticket pre-sale period. Supporters who purchase a membership will also automatically be enrolled into QPR Cash, the club’s loyalty scheme which was introduced in 2016 to reward supporters for their interactions with the club. For more information on this, please click HERE or to visit your personalised account page please click HERE. Supporters are also able to purchase their membership through our Direct Debit finance option, similar to last year which will automatically renew your membership in future seasons. 2017/18 Members who opted into our Direct Debit finance option will have their membership automatically renewed, with payment being taken on Monday 2nd July. Our PackTrack feature is also available again allowing Hoops members to track and manage their membership pack as it moves from our fulfilment house to their front door. All you have to do is simply type your Client Reference Number into the online portal below to be told exactly where your membership pack currently is – it’s that easy! To purchase your 2018/19 Hoops Membership, please click HERE.